Never let me go is a novel by Kazuo Ishiguro that came out in 2005. It’s one of the best books I’ve ever read. I keep coming back to it, thinking about it. Mark Romanek turned it into a film in 2010 but I never got around to watching it back then. I bought the dvd a few months ago and finally watched it. Romanek’s adaptation of the book is beautiful and haunting and captured the mood and the essence of the novel very well, I think. On ravelry there’s a group dedicated to knit spotting in films, As Seen in the Movies, and since NLMG features a lot of knitwear it naturally recieved some attention. Someone commented on it and said that it was as if a TOAST catalogue had come to life. I agree! I love the earthy tones and simple style. 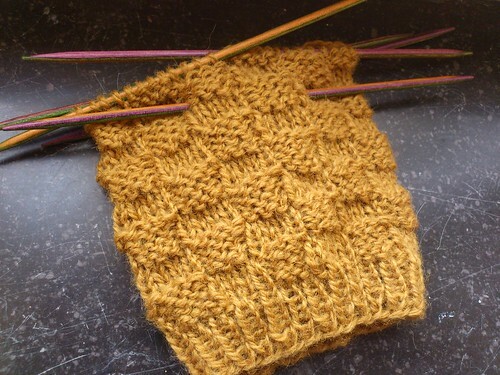 The fingerless wool mittens I’m knitting right now, Twig, are actually directly inspired by the film. Not that anyone in it wears anything similar, but my choice of colour and style is inspired by it. First mittens finished, need to weave in ends. Autumn really is here now and it’s getting colder every day. I haven’t seen any frost yet, but I don’t think it will be long now. Here’s another little project to keep me warm. I’m not using a pattern for this project, it’s all improvisation. I’m using 100% wool yarn from Kampes that I bought at Marias garn back in 2006. I have almost an entire skein left from the original project, perhaps you remember these? Even thought I try not to, I constantly come back to not being satisfied with only working on my WIP’s. I’ve made some good progress on the striped scarf, the back of the red cardigan is soon finsihed, but I needed something quick. A quick knit. A quick RESULT. I’ve had some light blue Debbie Bliss Merino Aran in my stash since… oh, I don’t know, forever? It just so happened that now is a good time to do something with that. I have 150 grams in my stash. So, what to knit? Well, I like to think that someone, mostly me, should have a real use for the things I create. So what do I need that doesn’t require more that 150 grams of Merino Aran? Recently, I’ve walked to and from work. It’s a 45 minutes walk one way. Since the weather has been really cold for the last couple of weeks I can’t go outside without mittens. No problems there, I have a lot of different mittens, mostly hand-knitted by me. However, after walking for about 10-15 minutes my hands get really warm and I often take the mittens off. Which leaves my wrists cold. Aha! 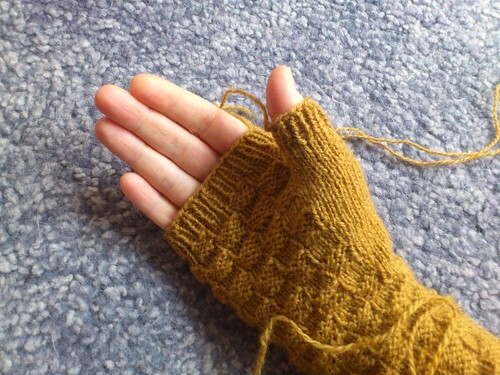 Ergo – I need fingerless mittens! Warm wrists – cool fingers! The pattern was easy to choose, it’s by Ann Budd from the book Holiday Knits. I’ve actually had my eye on this pattern for a long time, but never thought I’d have a use for fingerless mitts. When I first started knitted I wanted to learn something new from each project. I don’t always do that anymore, but I find it very satisfying that with a simple project like this I’m actually doing three things for the first time: short rows in garter stitch, three needle bind-off and a (to me) new way of knitted cast on. Just like that! I’ve finished the first mitt, and the second one is underway.